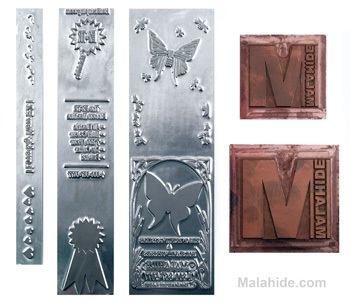 Magnesium and copper dies are chemically etched using a process known as photoengraving. In order to produce photoengraved dies, one must first create the artwork that is to be etched on the die. Most artwork is created on computer. There are many graphics programs to choose. Many companies choose to use either : Corel Draw or Adobe Illustrator. Quality dies begin with quality art. Try to only work with black & white artwork, 600 DPI minimum. The goal is to have text and curves with smooth lines and edges. Pixelation or any visible ‘steps’ in the edges or corners of the artwork will be reproduced on the die and then reflect in the hot stamp. Think of hot stamping in relation to spot color printing : the artwork disciplines are very similar. Fonts should be medium to heavy @ 8+ points. Bold graphics are best, but also try to avoid wide areas of solid coverage, line art, dot art, and halftones. Once your artwork is complete, the computer file is submitted to your diemaker through their web-site or by e-mail.